Habit: Annual or perennial herb. Stem: 1--3.5 dm, densely appressed-hairy. Leaf: 1--3.5 cm; stipules 1--1.5 mm, entire; blade lanceolate, +- hairy, entire to faintly toothed. Staminate Flower: sepals 2--2.5 mm; petals +- 2 mm, glabrous; stamen column +- 1 mm. 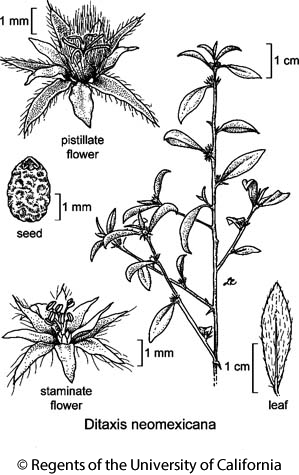 Pistillate Flower: sepals 3--4 mm, abaxially hairy, margin +- entire; petals +- 2.5 mm, lanceolate, glabrous or appressed-hairy, hairs not exceeding petal tip; ovary stiff-hairy, styles free, lobe tips not expanded. Fruit: 3--4 mm. Seed: +- 2 mm, angled, pitted. Synonyms: Argythamnia neomexicana Müll. Arg. Citation for this treatment: Mark H. Mayfield & Grady L. Webster 2012, Ditaxis neomexicana, in Jepson Flora Project (eds.) Jepson eFlora, http://ucjeps.berkeley.edu/eflora/eflora_display.php?tid=23176, accessed on April 20, 2019.
s edge DMoj, DSon; Markers link to CCH specimen records. Yellow markers indicate records that may provide evidence for eFlora range revision or may have georeferencing or identification issues. Purple markers indicate specimens collected from a garden, greenhouse, or other non-wild location.